Crazy addicting! 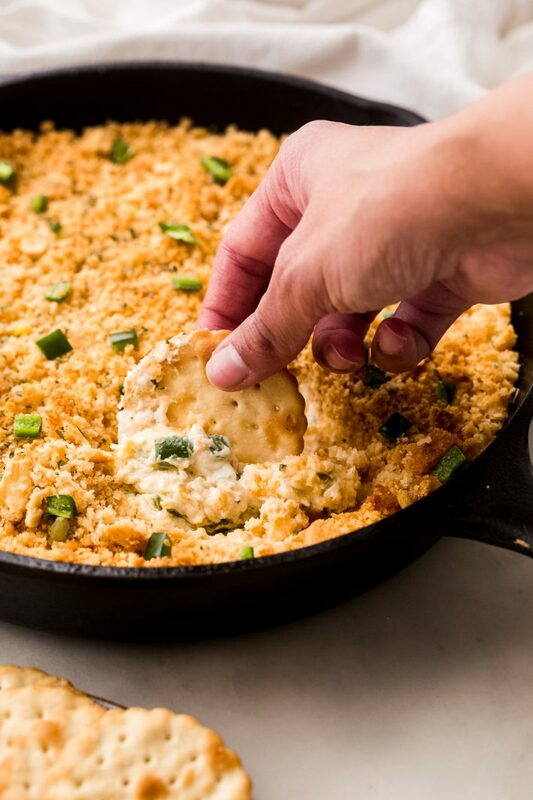 My jalapeño popper dip is like nothing you’ve had before. It’s loaded with pickled and fresh jalapeños but doesn’t bring a whole lot of heat, serve it with crackers or tortilla chips and watch the crowd go wild! 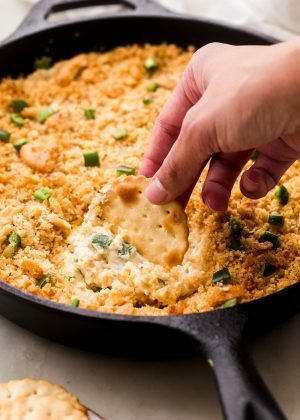 This easy and addicting jalapeño popper dip was an instant hit for us and everyone we shared it with! The first time I made this dip was for a game night that Anees and I were hosting. I put it together on a whim to have something warm to enjoy, instead of your standard salsa and chips. I didn’t think it would be such a big hit. But I think it was all because of the secret ingredient. It adds the most delicious tang to this dip. More on that in a minute. I love this dip for so many reasons, but mainly because it takes like 15 minutes to put together. 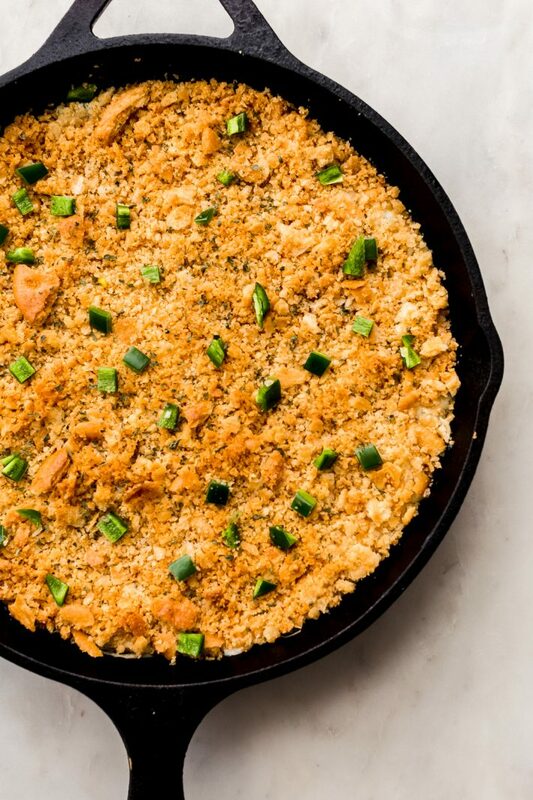 All you do is blend everything, top it with a simple three ingredients buttery crumb topping, and let it bake. You can bake this right before your guests arrive so that it’s warm and bubbly straight from the oven. Have you started putting together your Super Bowl menu? I’m not sure what dip I’ll be making this year, but I’m throwing together a batch of my Texas chili . This isn’t the first time I’ve shared a dip with you around the big game. Have you made my cheesy chili dip  yet? There’s also my favorite spinach and artichoke dip  that you’ll love if you haven’t made it yet. If your slow cooker is already occupied (check out the honey chipotle meatballs  if you need ideas), then this dip is perfect to put together and bake in the oven. Last year I shared a Philly Cheesesteak dip  in honor of my husband’s football team making it to the Super Bowl. And even though sadly, they lost, that dip was a home run, or err.. a touchdown! Can you tell I’m so not into the sports aspect of the big game? Hashtag – I’m just here for the spread. Okay, enough of the suspense! I said I’d tell you the secret ingredient now, and I will! It’s a hint of ranch seasoning. I’ve made this dip without it, and it just didn’t have the same flavor. The buttermilk in the ranch seasoning mix gives this dip that much needed tang and it so addicting! 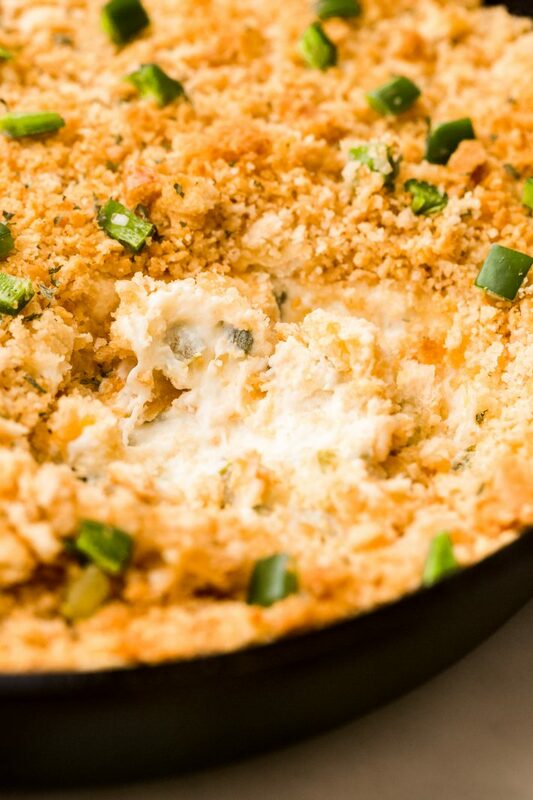 WHAT DO YOU NEED TO MAKE THE CRACKER CRUMB TOPPING FOR JALAPENO POPPER DIP? We didn’t find it spicy! I always remove the seeds and ribs from the fresh jalapeños to keep the dip on the milder side so everyone can enjoy it. If you usually prefer a spicier dip, feel free to leave the ribs and seeds in! 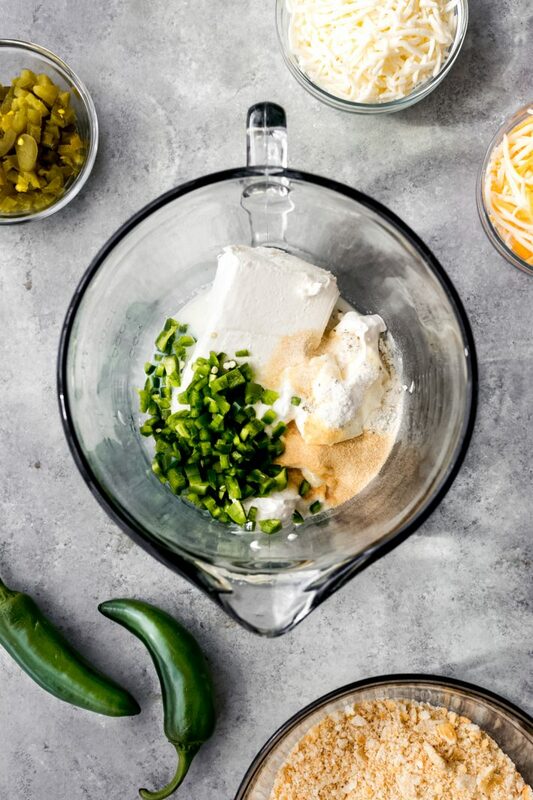 WHAT IF I DON’T LIKE SPICY FOOD, HOW CAN I MAKE THIS JALAPENO DIP MILDER? If you aren’t fond of spicy food at all, I suggest removing all the seeds and ribs from the fresh jalapeños and using ‘tamed’ or mild pickled jalapeño peppers. Some brands clearly mark the level of heat on the bottle. I usually make it a point to get the ones that aren’t spicy! I haven’t tried making my jalapeño popper dip in the slow cooker yet, but my best guess is that yes, you can. I’m basing this on my slow cooker spinach and artichoke dip  that I’ve shared. It’s a pretty similar recipe and so the cooking time should be roughly the same. Keep in mind that you’ll need to cook the crumbs in the butter in a hot skillet and then add them to the slow cooker at the end. If you cover the slow cooker, once the dip is cooked, it might end up softening the crumbs. For this reason, I prefer to make this dip in the oven instead of the slow cooker. However, if you’d still like to do the slow cooker version, you’ll need to stir everything together in a large bowl (or in your slow cooker if it’s larger than a 3 quart.) Then let it cook on low heat for 2 ½ – 3 hours or until the dip heated through and the cheese has melted. Stir every 30-45 minutes to make sure nothing is sticking. 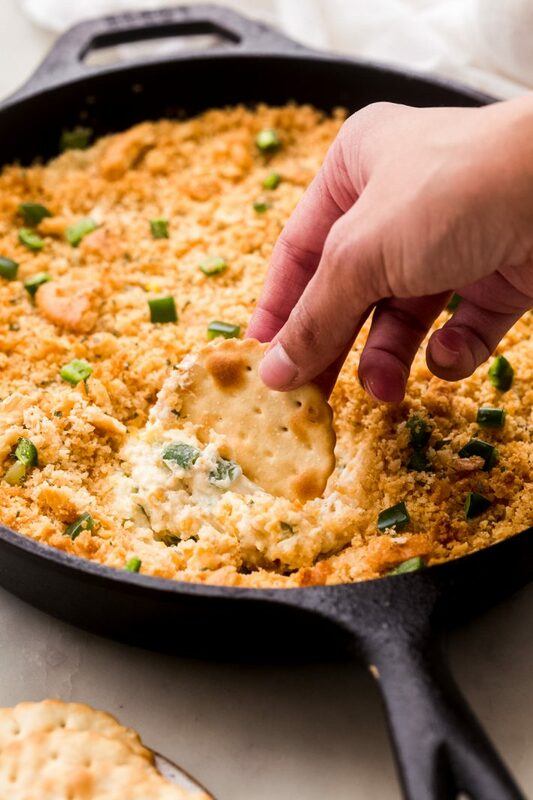 You can move the dip to a serving dish and then top it with the buttered cracker crumbs and serve it from a dish if you’d like too! 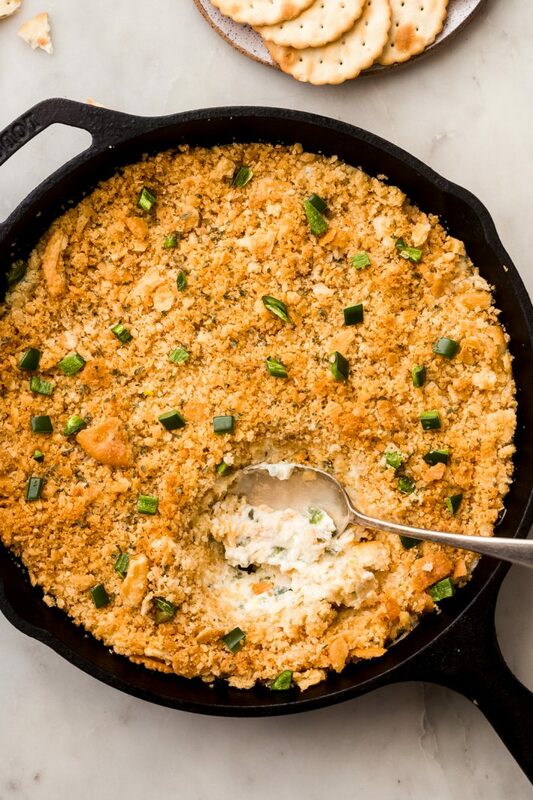 I’M EXPECTING A LARGE CROWD, HOW CAN I MAKE THIS BATCH OF JALAPENO POPPER DIP LARGER? Sure, can! I suggest baking it in 14-inch cast iron skillet, or larger. Or you can also bake a double batch in a 13×9 baking dish. I MADE TOO MUCH! 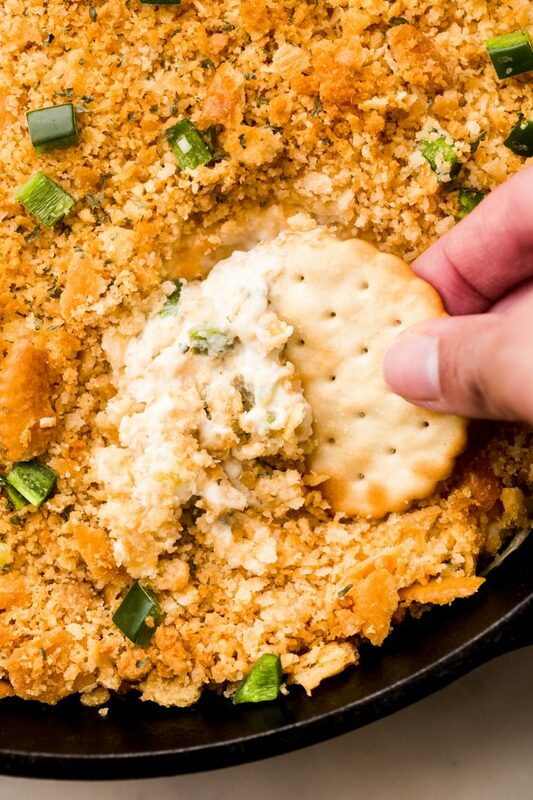 WHAT CAN I DO WITH LEFTOVER JALAPENO POPPER DIP? When I first tested this recipe, we had a bunch leftover from our game night with friends. It happened to be New Year’s Eve the next night, and so I pulled the dip out, reheated it in a 300ºF oven until it was warm and bubbly and I serve it right up! It tasted even better than it did the first night because all the flavors had an even better chance to mix and mingle. Even after the second round of serving, we had some dip leftover, so I added a big dollop to my Sunday morning omelet. And holy guacamole! It tasted like something straight off a brunch menu from a fancy place! I’m confident that you can stuff chicken breasts with the leftover dip as well and bake them coated with panko breadcrumbs for a yummy dinner as well. I like to serve my homemade dip with Ritz crackers and wafer-thin tortilla chips! PREP: Position a rack in the center of the oven and preheat the oven to 375ºF. Spray an 8×8 baking dish or a 10-inch cast iron skillet with nonstick cooking spray, set aside. WHIP: In the bowl of an electric mixer, whip the cream cheese, sour cream, mayonnaise, milk, onion powder, garlic powder, and ranch seasoning and continue to whip until fluffy and combined, about 1 minute. Using a rubber spatula (or on the stir setting of your mixer) fold in the pickled and fresh jalapeños along with the cheddar and mozzarella. BAKE: In a small bowl, combine the cracker, parmesan, and drizzle in the melted butter to form a coarse meal. Spread the cream cheese mixture in the prepared baking dish and top with the cracker crumbs. Bake for 15-20 minutes or until the dip is hot and the crackers are golden brown. Sprinkle with chopped parsley and serve warm with additional crackers. Replace the fresh jalapeños with additional tamed (or mild) pickled jalapeños for a milder dip.